EDIT: This location is closed, but if you still want fried pizza there are other Forcellas to be found. While in New York, I ended up making my way to Forcella in the East Village to grab some pizza. After all, no trip to New York really counts unless pizza is involved. Forcella’s pizza, though, was much more Italian than New York-style and even that Italian had a twist to it. That twist was a little something called Montanara, which is more than just a combination of the state of Montana and marinara. No, at Forcella, Montanara meant fried pizza and I knew it had to be mine. 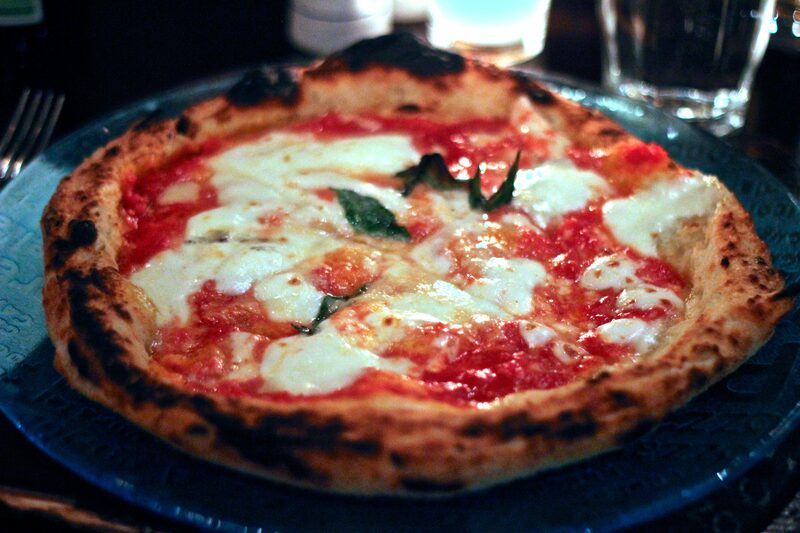 This pizza was topped with tomato sauce, mozzarella, parmesan and basil, which all have the makings for a good pizza. Upon arrival, it looked no different from the other pizzas on the table, but it only took one bite to recognize the difference. The dough had undoubtedly been fried because it had the distinct taste of elephant ears at carnivals. To be honest, it was kind of an odd combination of taste. The toppings were all pretty good, but a little cinnamon and sugar might have been better on dough like this. On top of that, the dough was soggier than I would have liked. Alas, you can’t win them all and frying does not make everything better. I must say that I am glad I tried out the Montanara, but can also safely say I don’t need to return.